Tell us about yourself. 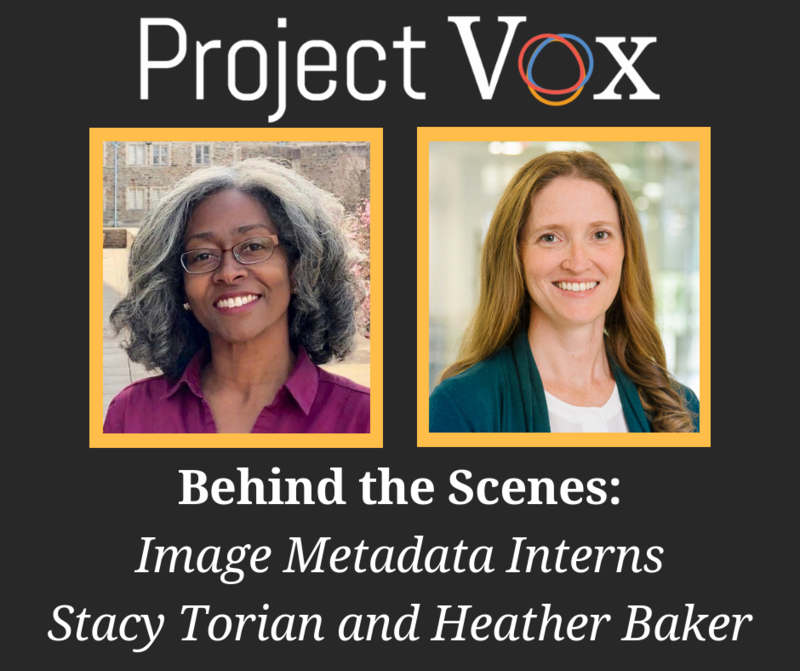 What brought you to work as an Image Metadata Intern for Project Vox? Stacy: I am an aspiring librarian with interests in history, women’s studies, African American culture, and outreach. I came to Project Vox to expand my librarian skill set and to support the study of women philosophers. Heather: As a graduate student studying digital librarianship, I have found that I am most interested in working with metadata. It appeals to my detail-oriented nature, and I love the way the metadata can be created and organized to increase discoverability and understanding of an image. Why is your work important for the growth of Project Vox? Stacy: The goal of the project is to create a straightforward method of organizing image files and all their identifying data. This will allow Project Vox team members to locate images and their usage guidelines more quickly. The less time people spend hunting for images, the more time they can spend promoting Project Vox to the public. Heather: The behind-the-scenes metadata work on this project is critical to each stage of an image’s life cycle, and team members may need different information at different stages. Working to create metadata that is both consistent and concise supports the team members regardless of their individual needs, making it easier for them as they work to grow and share the collection. What are some of the things that you are learning while working on the Project Vox team? Stacy: Every week, I learn something I did not know about data management, copyright, or the culture of academic libraries. I enjoy seeing all the creative ways that the Project Vox team and other Duke staff are using digital resources to advance scholarship. Heather: It’s amazing to see what can be done by a team of people who come from different academic backgrounds but share a common goal. I have watched how the team approaches each new challenge with varying perspectives, and it has taught me to be mindful of those perspectives when working on metadata solutions that will best serve the project over time. Stacy: When I was younger, I was discouraged from taking undergraduate philosophy classes because I did not have “a background in philosophy.” Fortunately, I ended up taking a philosophy course anyway. Now, here I am working on Project Vox! Stacy Torian is a student in the master of library and information studies program at the University of North Carolina at Greensboro. Her interests include feminism, African American culture, and oral history. Heather Baker is a graduate student at NC Central University studying Digital Librarianship with a background in educational publishing.